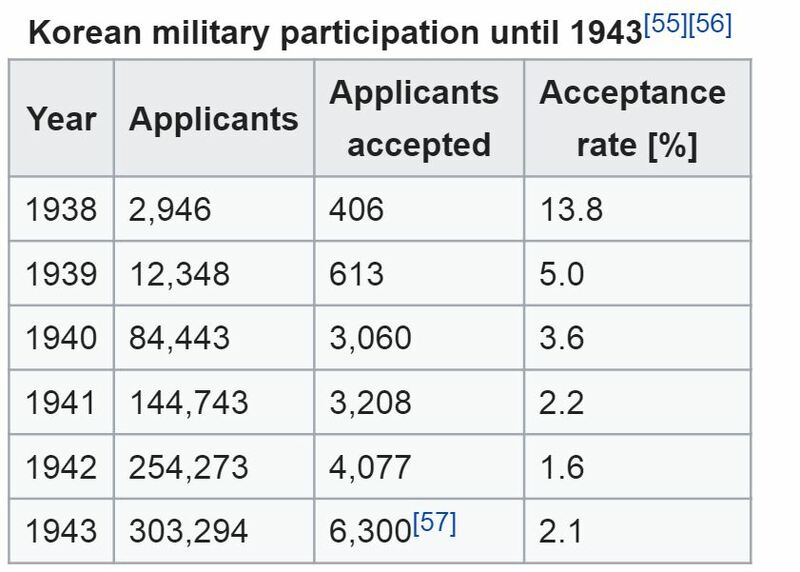 Citing two sources, the article Korea under Japanese rule gives the following figures showing that very few Koreans who volunteered for enlistment into the Japanese army 1938 – 1943 were actually accepted. Although some would have failed the medical, the acceptance seems far too low for this to be the only reason. Another possible reason is that the Japanese might have been worried about loyalty of these recruits, though even before World War II there were examples of Koreans who had been promoted to officers in the Imperial Japanese Army: Hong Sa-ik - later executed by the Allies for War Crimes - is one example, while Yi Un reached the rank of Colonel in 1935 and Lieutenant General in 1940. Five others also reached the rank of General by the end of the war. Initially, the Army Special Enlistment System targeted "those who are better-off than average and ideologically solid"...However, it turned out that these wealthier Koreans were for the most part unwilling to enlist. blackmailing new graduates, putting pressure on families by detaining the father, or tricking them into enlisting by falsely informing them that doing so was just a formality. Despite the apparent contradictions in these two articles, they do both show that the number of Koreans serving in the Japanese army was low, which brings us back to the main question: why was this the case? Were perhaps those Koreans applying mostly from poor families and thus not the ones the Japanese wanted? Note: I say 'apparent contradictions' as I'm not sure if I've correctly understood some the points in the second article cited - I'm no expert in this field. The reason is simple: those were the allocated quotas. The apparent contradiction observed in the question stems form the fact that Japan was not as politically united as is often assumed. The recruitment of "volunteers" was carried out by the colonial administration of Korea, where there was significant support for the idea. Aside from some Koreans who thought they could leverage service into more political rights, Japanese officials in the General-Governerate, as well as officers of the Korean Army, had been enthusiastic advocates of enlisting Koreans. They conceived military service as both a demonstration of, or alternately a vehicle for, promoting Korean integration, which was incidentally also their jobs. (What seems to be not mentioned yet is that the volunteers were sent to training centres for "re-education" into loyal imperial subjects). It's also worth noting that, even though racism was pervasive and deeply ingrained even among advocates, many Japanese thinkers and colonial officials were ideologically committed to racial equality. Recruitment of Korean volunteers was thus in no small part a propaganda campaign to persuade ethnic Japanese into accept Koreans as equals. The actual decision to accept volunteers into the Imperial Army, however, rested with the military in Tokyo, where the Special Volunteers program was conceived of merely as a trial. Thus, regardless of how many "volunteers" the colonial administration was churning out to impress metropolitan Japan, the War Ministry never planned on accepting more than a handful in the first place - the quota set for the first year was 400. In any event, most recruits probably wouldn't have qualified. Besides physical requirements, the Imperial Army insisted on proficiency in the Japanese language as a measure of "recruit quality", since the Koreans were to serve in integrated units. For obvious reasons, this disqualified most volunteers: the General-Govenerate of Korea estimated in 1937 that only 5.85% of young Koreans were able to converse in Japanese. Furthermore, the recruits were also screened for ideological fitness. Many applicants were thus rejected for personal or familial sympathies towards Korean nationalism, or communism. "[E]ven after July 1937 War Ministry officials still overwhelmingly believed that the recruitment of Koreans was premature. However, considerable effort on the parts of the Korean Army's high officers and the Government-General alleviated their fears . . . the military authorities inaugurated the new system on a trial basis, [so] the number of Korean volunteers initially accepted was very small." Palmer (at page 77 of the linked edition) has further statistics and explains that, for example in 1941, only about 50,000 of the ~145,000 applicants were true volunteers. Not the answer you're looking for? Browse other questions tagged world-war-two military japan korea or ask your own question. At the beginning of English Civil War, why did Parliament take a hard line with neutrals, thereby effectively helping Royalist recruitment?